I love rainbows. Everyone who knows me, pretty much knows this. It’s kind of an obsession. 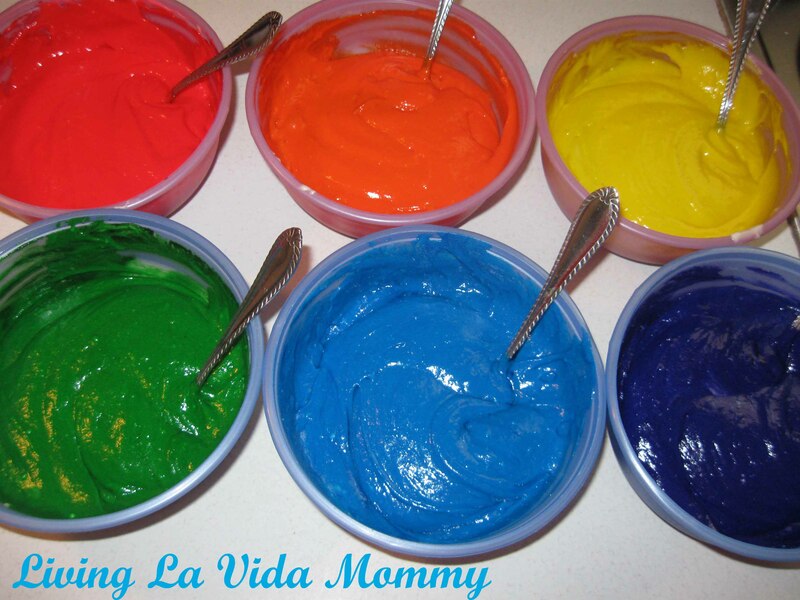 This weekend, for Saraphina’s birthday party I decided to make another rainbow cake. Unfortunately, it turned out a bit dry, but it was still pretty. In the hectic planning, it was a wee bit overcooked, but I have made this cake before with awesome results, so it’s all good. 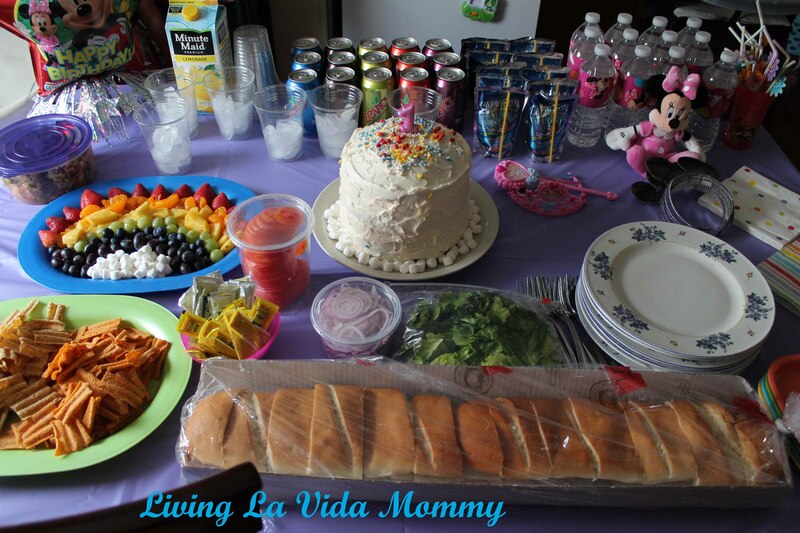 Here is the party spread. Rainbow out of fruit, yummy sub sandwich with fixins, Sun Chips, Broccoli Salad, Lemonade, you name it. Those Minnie Mouse water bottles are just wrapped in wrapping paper, aren’t they adorable? I used two boxes of white cake mix, prepared according to instructions. Once it was all well mixed, I separated it into six bowls in six equal amounts. Then I added the color. I used Gel Food Coloring, because it will not change the consistency of the batter like a liquid food coloring would. You also get a much bolder, prettier color with the gel. Looks like finger paint in the bowls, doesn’t it? Bake for slightly less than the box calls for, because you are using less batter in the pans. I used 9 inch rounds for each separate color. 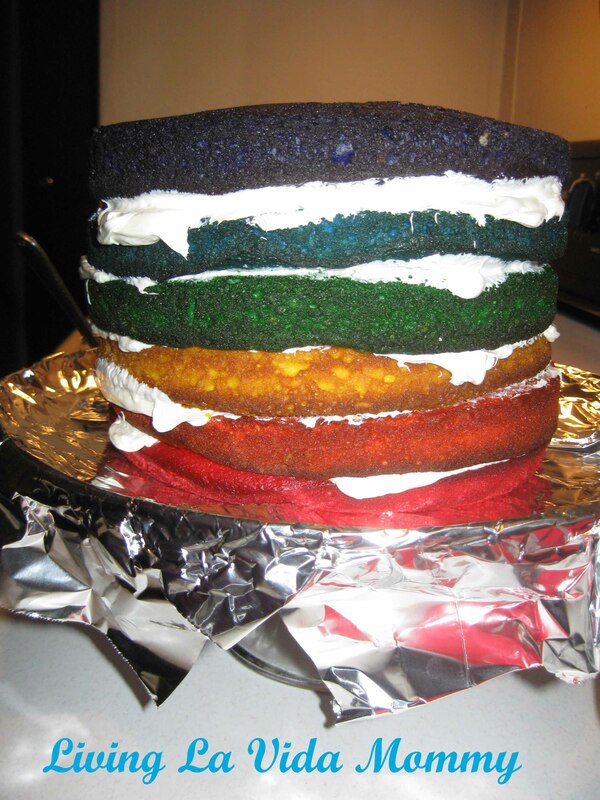 Once cooled, stack with layers of frosting in between. I used cream cheese frosting. Mmmmm. I iced it all white to hide the magical awesomeness hidden inside. How’s that for fancy? It’s a big hit, especially with the first cut of the cake when everyone sees how wicked cool you are for making such a fantabulous confection. And if you don’t over bake it, it tastes pretty amazing too. Have you entered my No Throw giveaway yet? What, don’t you like free things? Go enter! Right now! Here’s the link. That wasn’t so hard, now was it? This is a super quick, super cheap way of cooking chicken to have on hand for all kinds of awesome recipes. Buying a whole chicken, rather than the boneless skinless packages, is amazingly cheaper. I can get a package of two whole chickens from Sam’s Club for about $7, and each chicken individually will give me enough meat for at least four meals, plus you can make your own chicken stock out of the leftover skin and bones. I usually cook these up and shred the meat, putting them in freezer bags for future use. Same for the stock, but we’ll get to that in a bit. Fancy looking, eh? Yes, that chicken is frozen. 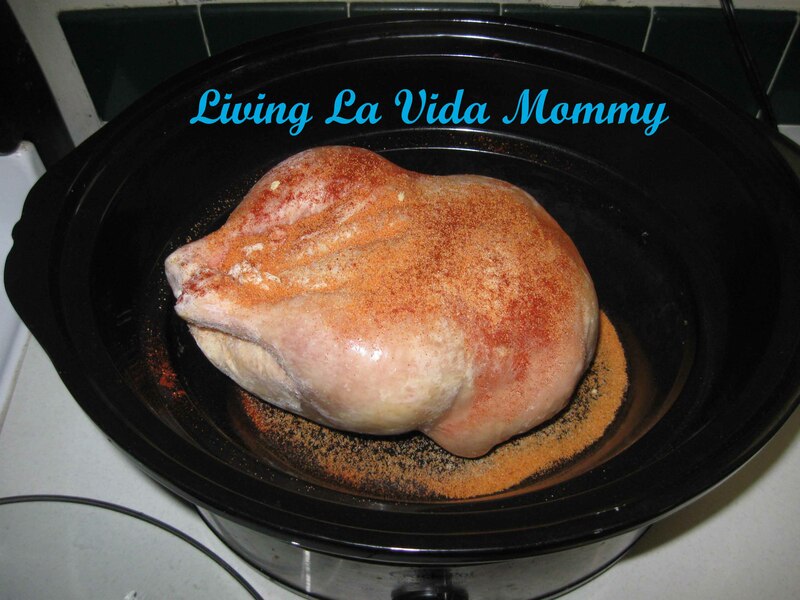 I throw it in the crock pot, add seasonings, turn it on low for about 8 hours, and you have awesome, super juicy chicken. No added water, and your house will smell super yummy. If you then refrigerate the broth, you can later easily scoop up the hardened fat. Yum. I put the broth in freezer bags in measured amounts for cooking and then throw them in the freezer. If you season your chicken without salt, then you now have a salt free stock. See how easy that was? There are bajillions of uses for shredded chicken. In this house we are partial to quesadillas, fajitas, and chicken salad. Those are the three most popular uses in mi casa, but there are tons of casseroles and other yummy things to be made as well. I just love the feeling of having yummy, ready to use, cooked chicken that I can pull out and use for a quick meal. It’s a good thing. 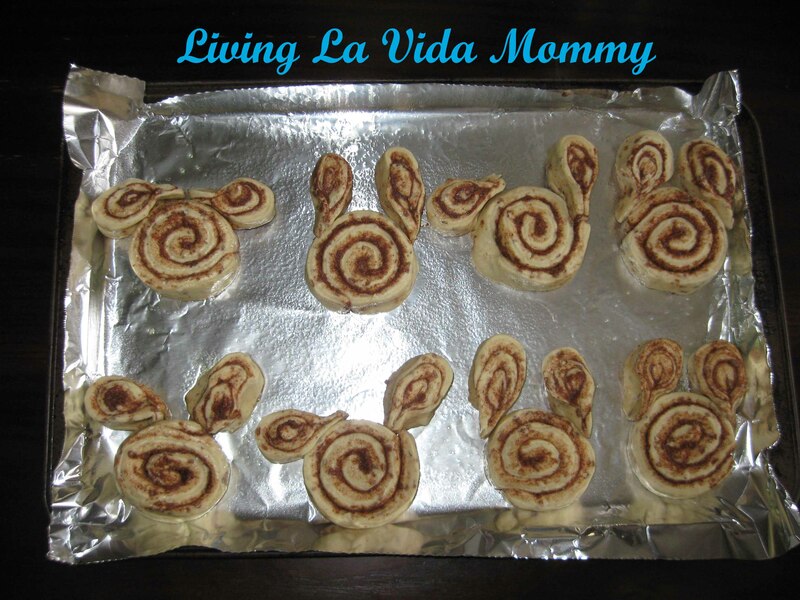 To accompany our yummy Breakfast Casserole on Easter morning, we had Bunny Rolls. The concept could not be simpler. I used to tubes of ready made cinnamon rolls. One tube made the bunny heads, one tube made the ears. The ears are just one roll cut in half and folded over to form the ear shape. Then you press it in place and bake as per the directions. Could you make these by scratch? Of course you could! Home made cinnamon rolls are the bomb diggity! This mama was busy with nine million other activities though, so as my kids would say, “You get what you get and you don’t throw a fit.” What? Its not like they hear that from their Mama….every single day. We woke up Easter morning to the smell of breakfast waiting for us. How awesome is that? The night before, I filled the crock pot with an egg casserole recipe that cooks overnight, had the coffee maker all filled and ready to go, and had bunny rolls ready to throw in the oven. Upon waking, I simply flipped the coffee maker on, turned off the crock pot and threw the bunny rolls in the oven. By the time the Easter baskets had been gone through, breakfast was ready. Oh, Mama loves it when things are so well organized! Doesn’t that look yummy already? This is a pic before cooking. 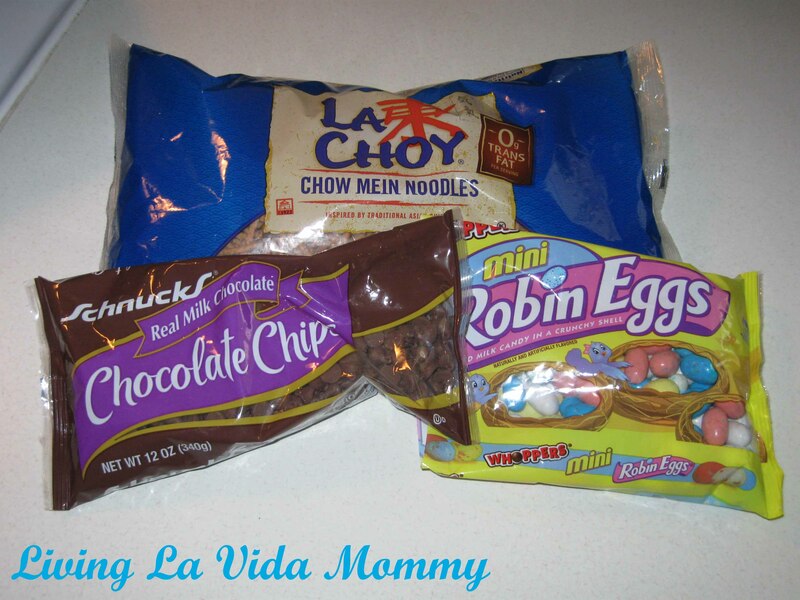 It is super easy, and can easily be modified to include whatever you prefer or what you happen to have on hand. Cook your bacon and set it aside. Dice up your onion and your bell pepper and cook it in about a tablespoon of olive oil (or whatever oil you prefer) with the mushrooms. If you like your veggies extra soft, cook longer. If you want them crisper, cook them shorter. Adapt this to whatever works for you. Spray the inside of your crock pot with non stick cooking spray. 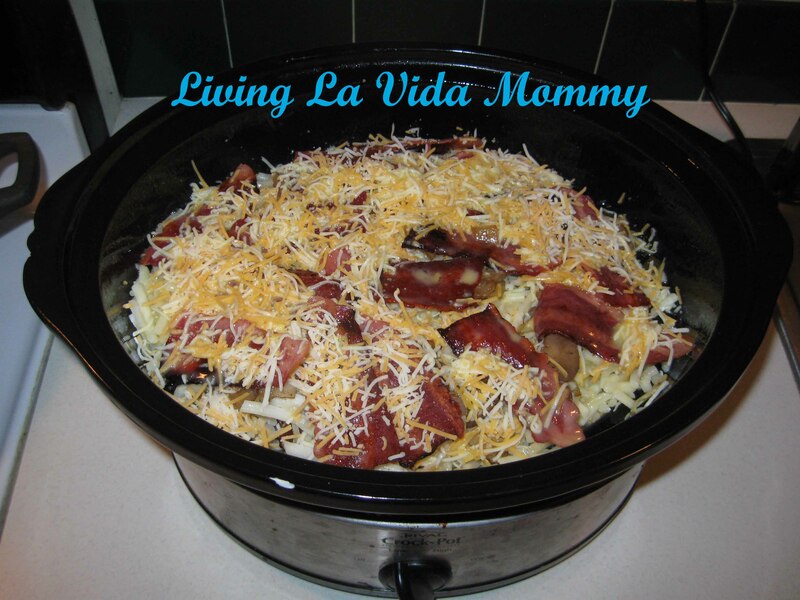 Add about 1/3 of the shredded potatoes, then 1/3 of the bacon, 1/3 of the veggies, and 1/3 of the cheese. Repeat two more times. Obviously. In a large bowl, add your eggs, milk and seasonings. Beat until well mixed and then pour on top of your ingredients. Put the lid on and cook on low for 7-8 hours or high for 3-4 hours. Make sure everything is thoroughly cooked. This made the house smell amazing! And it was delicious! This recipe makes a lot, so it is perfect for when you are having company over, or for making breakfast for the entire week. I think you could sub the veggies for any other variety you may like. Same with the meat. Sausage or ham would work well, and if meat ain’t your thang, well I’m sure this could be easily adapted into a vegetarian dish. This will definitely be added into regular rotation here. 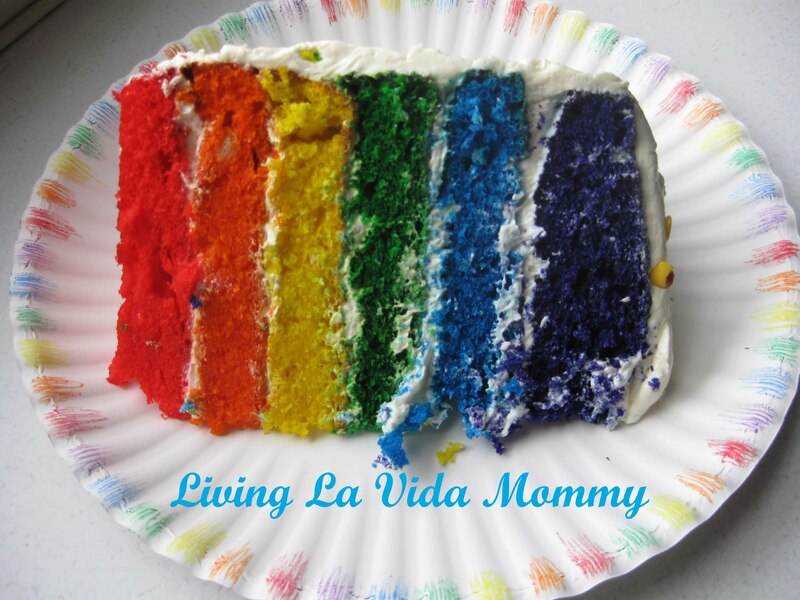 Oh my gosh, color Mama happy anytime rainbows are involved! Or unicorns, or kitty cats, or any other ridiculous girly stereo type. Hey, I’m a dork and I’m proud! 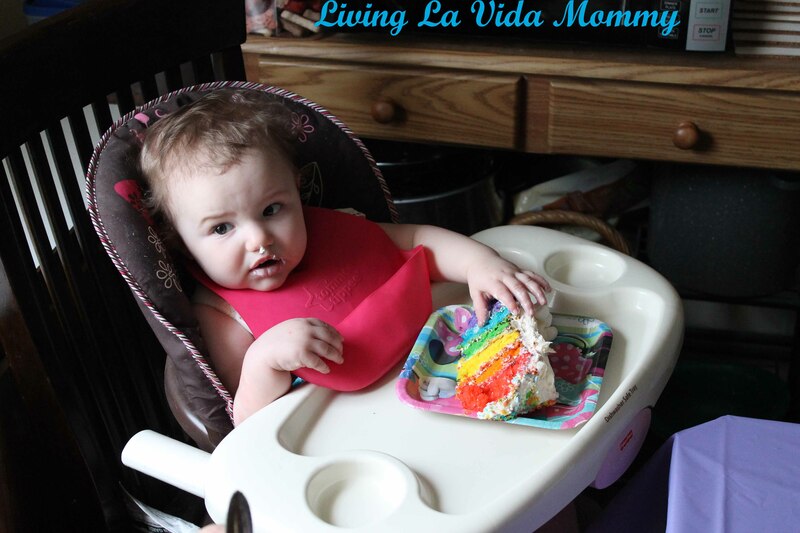 My Bella had a rainbow themed birthday a few years ago, and making all the rainbow goodies was absolute heaven to me! I love making anything more colorful, so when I saw a similar idea in my Family Fun magazine this month, well you knew I couldn’t resist! Start by hard boiling your eggs. Easy enough, right? Don’t ask me the perfect way to do this, because I have no idea. And then peeling the eggs? Ay Dios mio! A nightmare! Ugh! 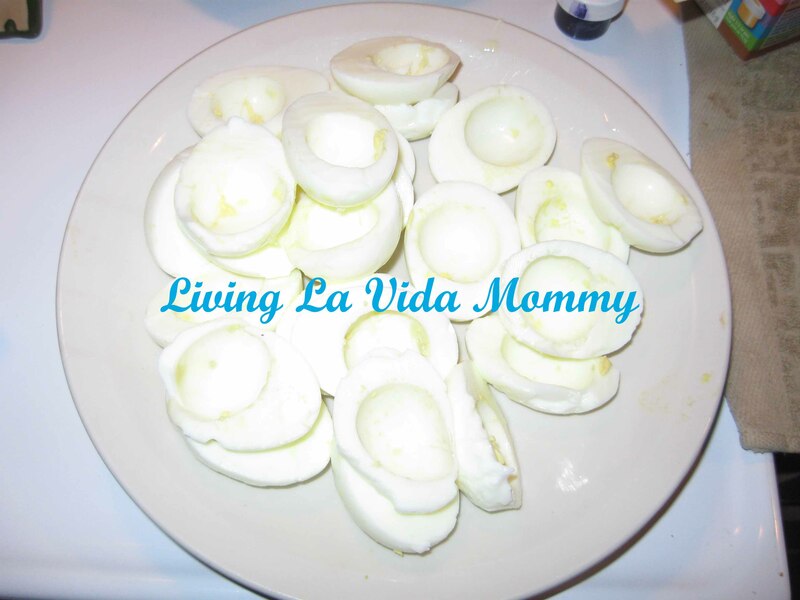 I have read and tried every trick there is for perfectly peeled eggs. I am convinced that it is impossible. That is my mutilated pile of egg halves. *le sigh* I think the end product turned out okay, but it sure would have been nice to have eggs that didn’t look like they were peeled with a weed whacker! Next, I took several mugs of water and added a smidge of food color to them. Nothing fancy or special. No vinegar or anything. Just water and a smidge of color. I had gel color, but it worked just fine. I placed several of the egg halves into each mug and let it sit for about 10 minutes until they looked all kinds of awesome. 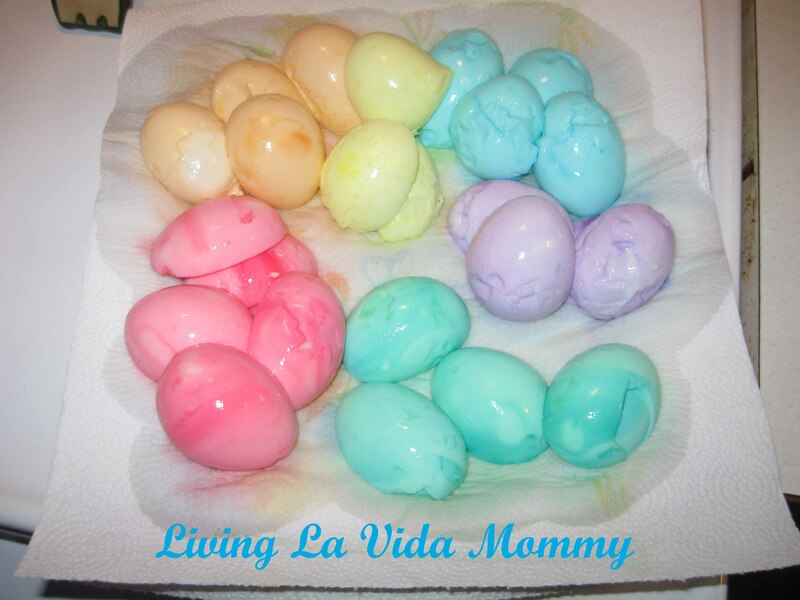 Well…..except for the chewed up look of the eggs… But the color looks totally awesome, right? Humor me here. Anyway, once dried, I filled them with the classic deviled egg filling. Mushed up yolks, mayo, hint of mustard, pinch os salt and a dash of pepper. 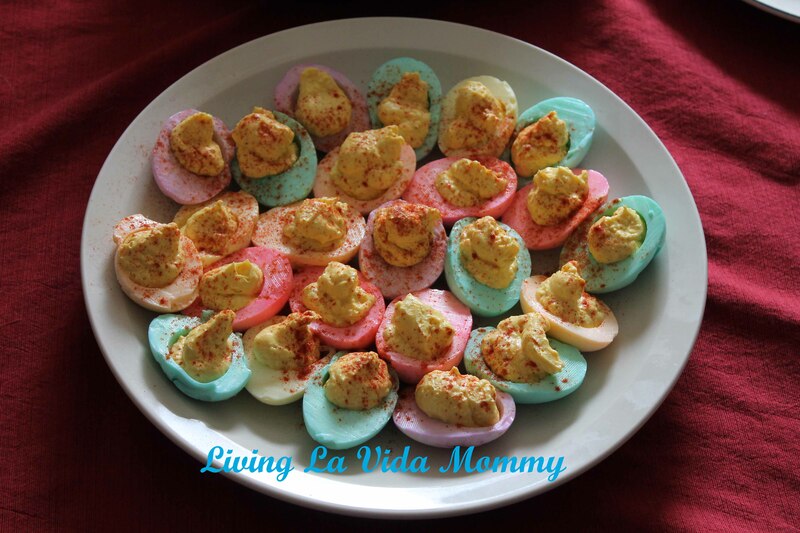 Topped with a little paprika and you have a neat new presentation of deviled eggs. Now see? When you can’t see the mutilated bottoms, they look pretty darn impressive, don’t they? And they taste pretty darn fabulous too. We had five left after the party, but those too quickly disappeared. I think these will become an Easter tradition. What an easy way to jazz up a classic recipe! 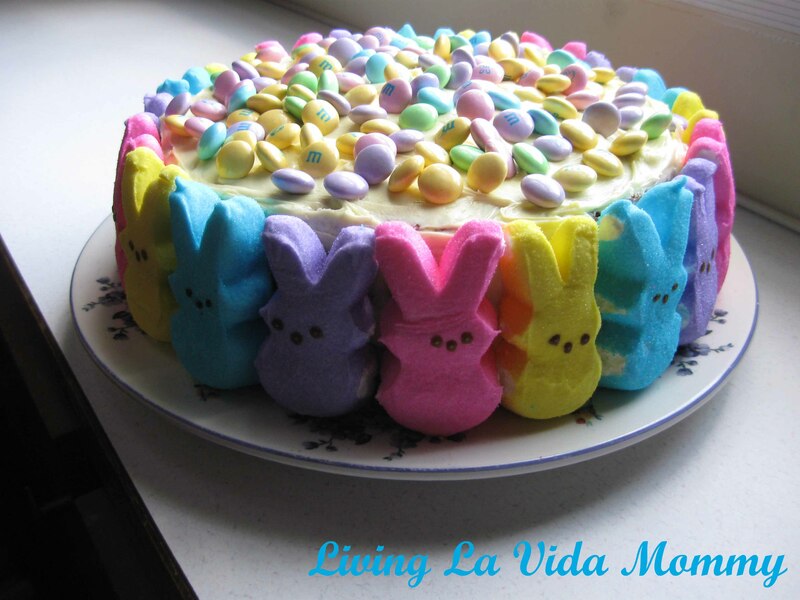 Peep Cake for my peeps! Magic! Ta da! Now tell me that isn’t the cutest darn cake you have ever seen. Go ahead, I dare you! Its not the cutest cake you’ve ever seen, you say? Well then, I declare you a liar, liar pants on fire! 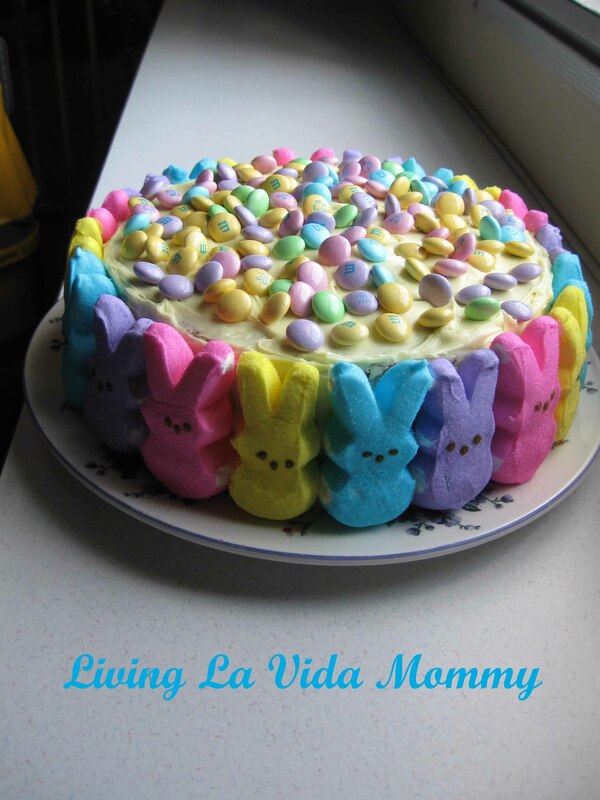 It is super cute, super festive, and the kids love it. 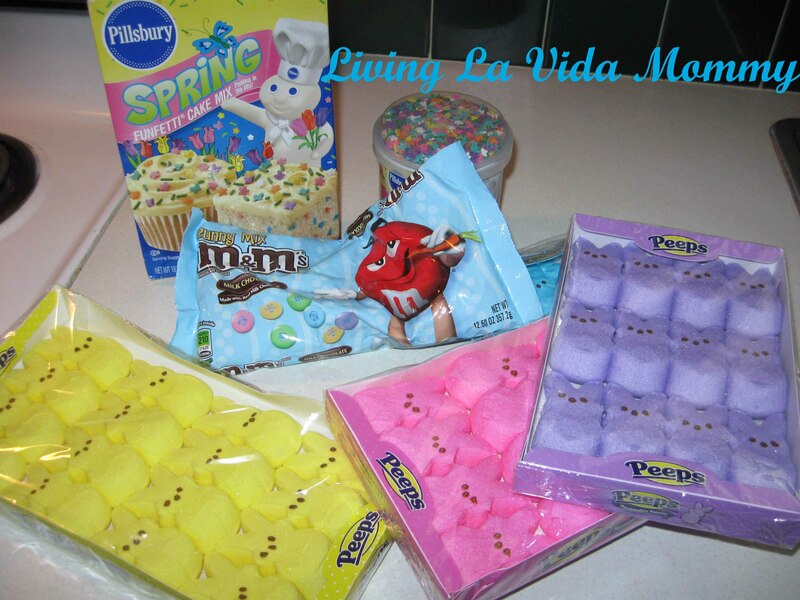 And if your kids like Peeps, well hallelujer! Even better! And then the proverbial light bulb went off and aha, I say! No really, I did in fact say “Aha!” outloud. Then Noah, my toddler, says “What Mommy?” To which I say, “Mommy had a great idea!” To which he says, “Awesome!” See? I’m not the only one in the house that over uses that awesome word. I just used the word ‘awesome’ to describe the word ‘awesome’. Yup. 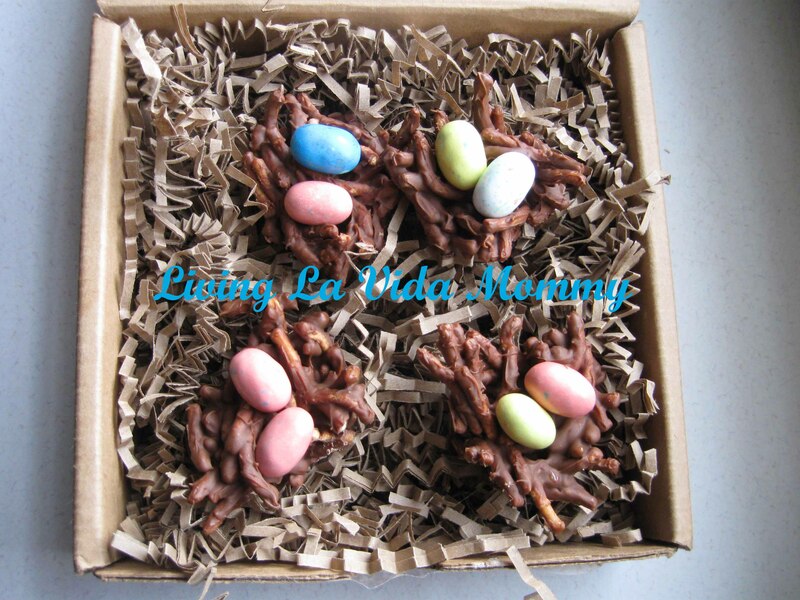 Gather up your Chow Mein Noodles, Chocolate Chips, and egg shaped candy. I used Robin’s Eggs, which were my second choice. I sent Abe out to get the little candy coated Cadbury Eggs, but he “couldn’t find them”. Whatevs. I think you get the idea. You could also use jelly beans or M&M’s, whatever your little heart desires really. Next, melt your chocolate chips. 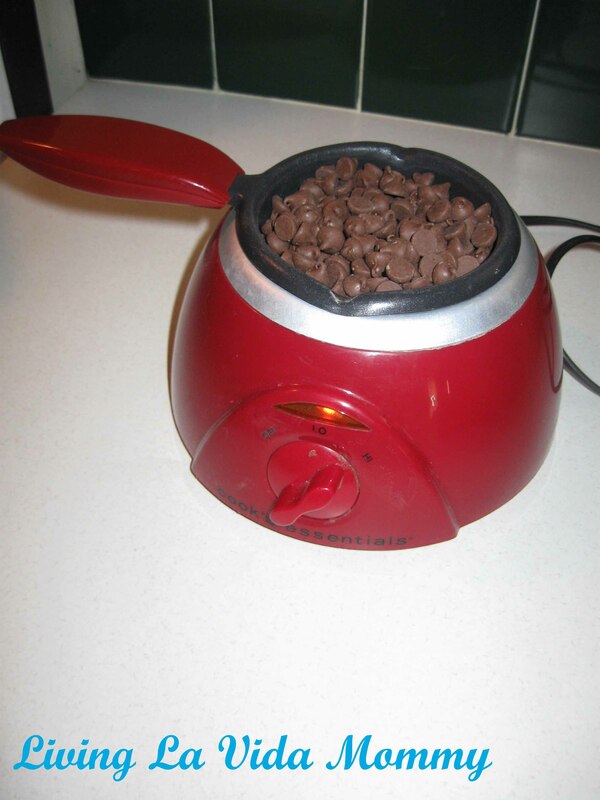 This is my handy dandy chocolate melter thingy that I got from QVC. Don’t judge. Home shopping is AWESOME and convenient. I’m not sure if they sell it anymore, but its pretty nifty. It only heats up warm enough to melt the chocolate, never scorches. Of course, thats its only purpose though, so if you don’t plan on melting loads of chocolate on a regular basis, you could do the double boiler method. Or the microwave, if you’re brave. Once its all melted, I threw about half the bag of chow mein noodles into a large bowl and poured the melted chocolate on top, stirring it all together to coat the noodles. I already had my mini muffin pan ready to go and sprayed with non stick cooking spray just in case. Using a spoon, put blobs of this mixture into the pan, noticing how it is already looking totally awesome and nest like. 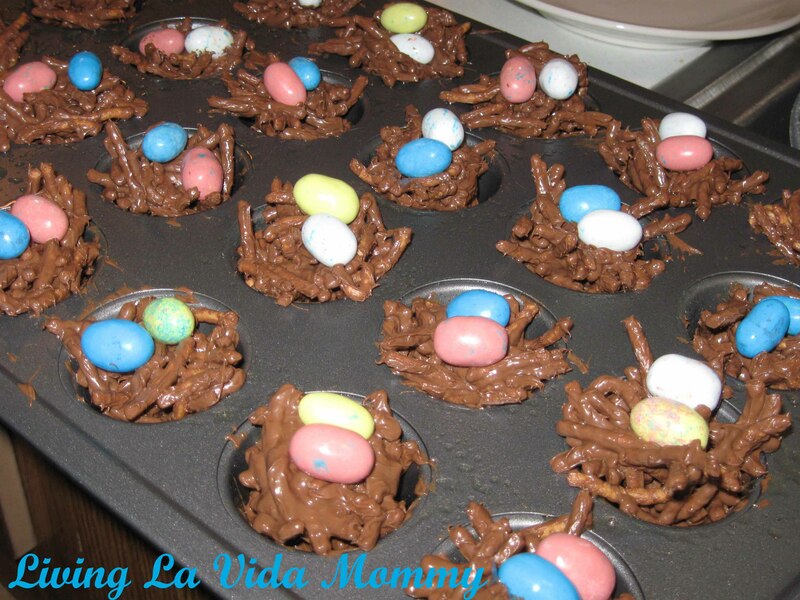 Once all the cups are filled, bust out your eggs and plop those puppies into the nests you just made. I did two eggs per nest because…..I wanted to. See how pretty and nest like they are? The melted chocolate will work as a glue to hold the eggs in place, no worries. Then I like to place the tray into the fridge or freezer to harden. I will admit, I had some anxiety wondering if they would come out of the muffin tin without sticking. They seemed pretty well stuck when I pulled them out this morning. I grabbed a butter knife to loosen the edges and they popped out without a problem though. So cute! And not too big! 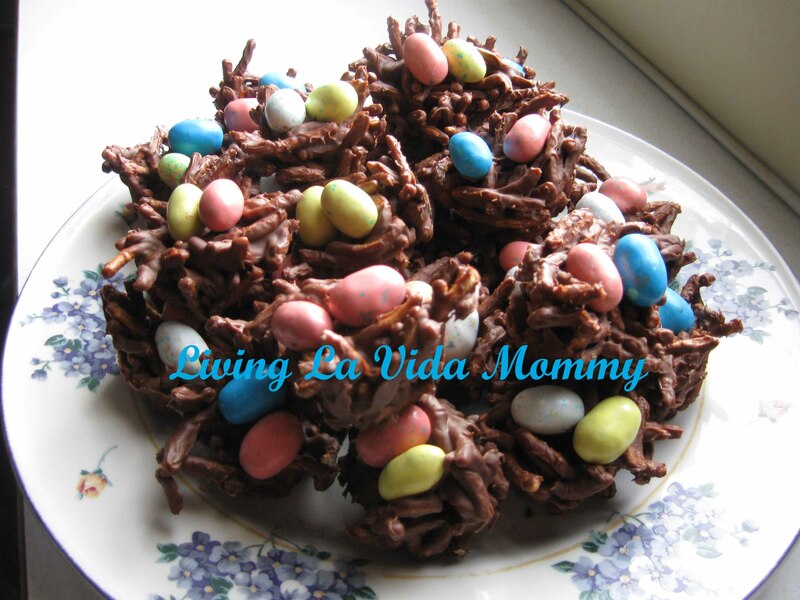 My mix made 24 little nests with one globby spoon full of chocolate and stray noodles for Mama and a bowl of chocolate-y goodness for the babies to fight over. I am *hoping* this lasts at least through Saturday when we are having a cousin playdate with the kiddos after some Easter activities. If not, well then there is photographic proof that I did indeed make these treats. Seriously. Blech! I hate touching raw meat. Not only does it feel absolutely disgusting, but I think of all the germs and scariness all up in it. Yeah, I’m kind of a germaphobe. But don’t get me wrong. I love meat. It is delicious. If God didn’t want us to eat animals, he would not have made them so darn delectable. True story. We had some ground beef sitting in the fridge that needed to be used, so Mama busted out the rubber gloves this morning and did some super quick freezer cooking. Don’t judge. 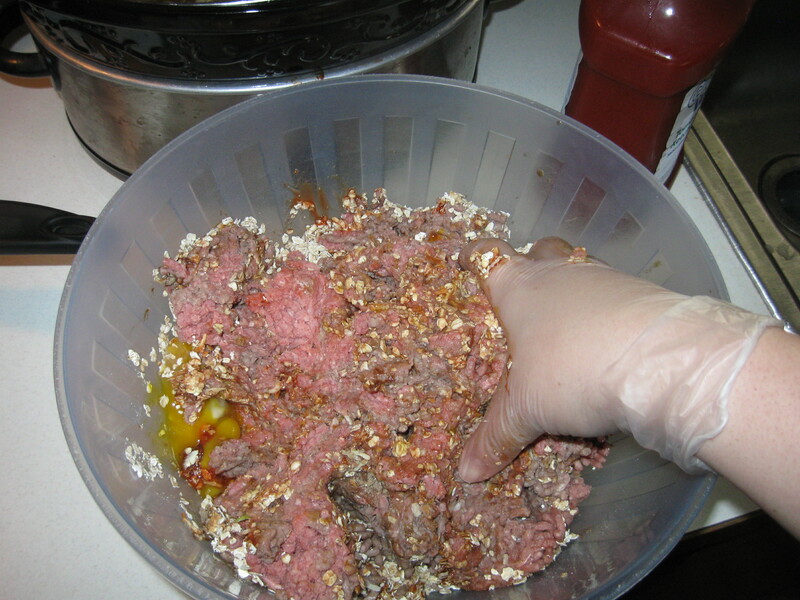 You probably want to use rubber gloves when you touch raw meat now too, don’t you? Don’t you? Its okay, its an awesome idea, do it. DO IT. Have you heard about freezer cooking? Its all the rage these days. Its actually kind of brilliant, especially if you have a crazy schedule with work and kiddos. Basically, you get meals ready to go and stuff them in freezer bags, store them in the freezer, and just pull them out for quick easy meals whenever you need them. With Abe working fulltime and Matt and Bella in school and scouts and dance, yada yada, it has been a huge time saver. My first stab at freezer cooking was……meh. Heres a tip. Taste test your recipes before making ginormous batches for several meals. Don’t blindly trust yummy sounding recipes you find online. You will regret it and your family will start to groan when you go to the freezer for an awesome freezer meal. Trust me, I know this from experience. I have a few meals in the freezer still that I am avoiding like the plague. And a few had to have such massive rescue work just to make them “eatable” that really, it took as much time as cooking from scratch start to finish. Today’s super quick freezer meals are a family favorite that lends itself to freezing well. Meatloaf. Easy peasy lemon squeezy as my Bella would say. Each meatloaf will easily be two meals plus extra for spaghetti, and I made two loaves. Probably took me about 15 minutes total to pull everything out, whip it together and then throw it in the freezer. Yeah, I wear gloves to touch raw meat, so what? Basically everything just gets mushed together and put in lined loaf pans. I lined my pans with foil and filled them, then threw them in the freezer to, you know, freeze. Once they are good and frozen, I will take them out of the loaf pans and throw the wrapped up ready to heat meatloaves into a Ziplock freezer bag with the cooking instructions written on the bag, you know, in case Abe decides to cook, and boom! Easy freezer meal. Its not a glamorous recipe, I realize, but it is my mama’s recipe, so it is in my opinion, the best meat loaf ever. My mom usually cooks hers in the microwave though. *gag* Mine gets thrown in a 350 degree oven for an hour or so to get that yummy thoroughly cooked flavor. Delicious, and so much less vomiting. Its a good thing.